This story takes place in the Marvel Cinematic Universe. 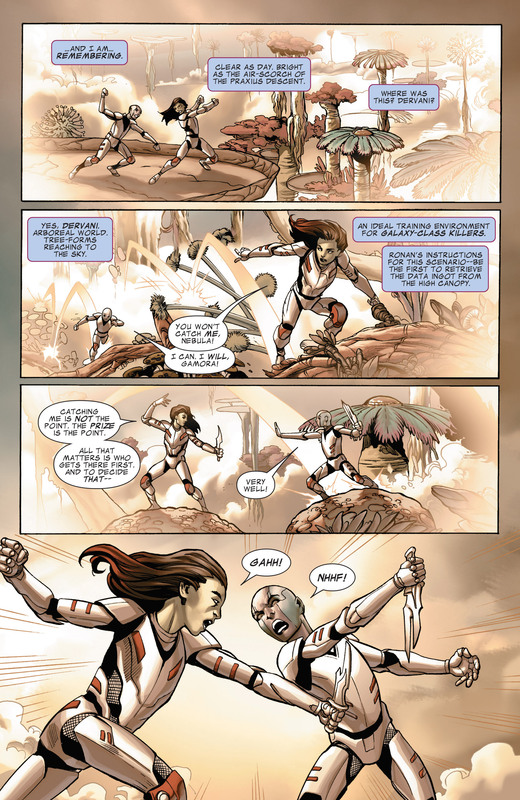 Throughout the issue we get flashbacks to Nebula's past as she tries obtaining the orb in the present. "Catching me is not the point, the prize is the point, so even though you won't catch me and I could just get the prize myself, I'm going to stop and wait for you to catch up so we can fight." I'm okay with that, actually. It feels like part of the weird sisterly hate-relationship. It's like siblings teasing each other, with more murderousness. Urgh! That Thanos design is horrible. Way too busy. Why must the marvel cinematic universe be so focused on adding unnecessary armour and overly complicated designs to it's characters? 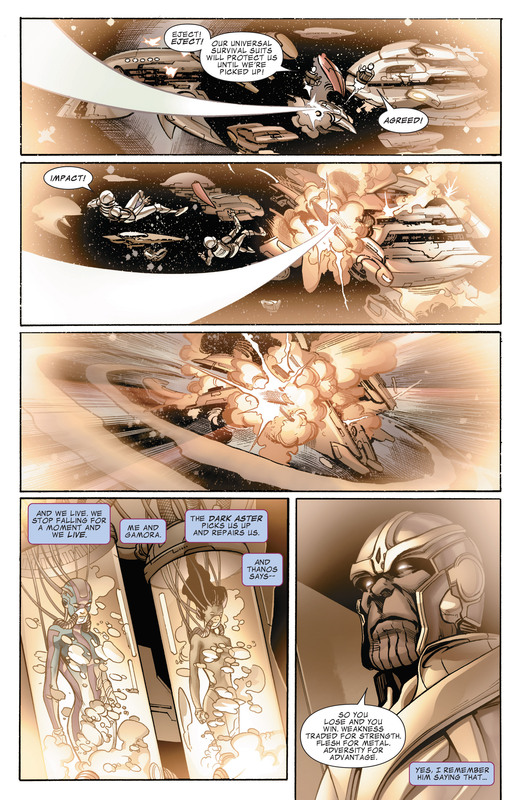 I hope this doesn't mean that the comics Thanos is going to follow suit.. 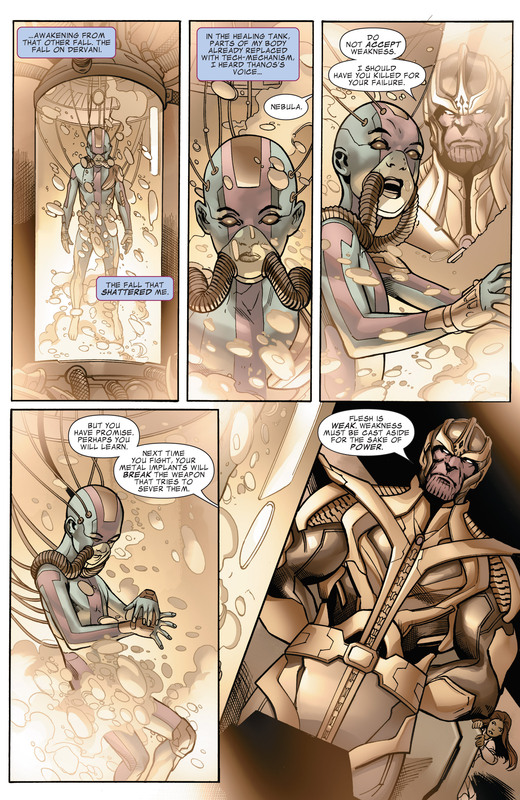 It makes sense after a fashion, for Thanos to have the gold armor: It looks Chitauri-esque. I'm at least 50% confident that by the time he makes his big splash in Avengers 3 (or wherever) he'll end up in something more akin to his classic/traditional garb. Did anyone else just totally love Guardians of the Galaxy? I think it's easily Marvel's best film, largely because it's its own story, and not weighed down by multiple-franchise continuity (even though that has its own appeal). I haven't seen it yet, but the reviews have been raves, and the box office spectacular. But it is nowhere (rimshot) near as good as everyone makes it out to be. It's not bad, but it's not great. It was absolutely fantastic. WIth the best stinger yet! Absolutely. It was a truly fun experience, and I wish any would-be film adaptations would take that to heart. I thought it was good... but it's nowhere near as good as you're all making it out to be. Call me a stick in the mud if you like, but I prefer when films take themselves seriously. 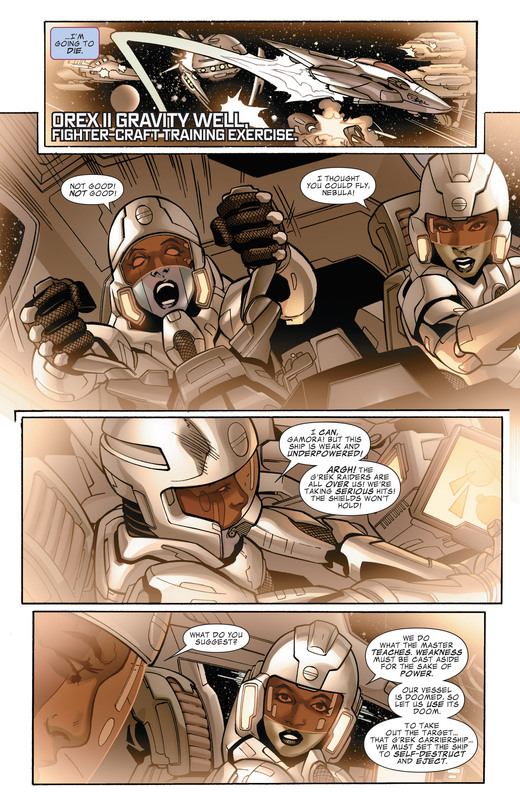 * Nerfing the Nova Corps. * Making Ronan into generic bad guy #4. * Drax being a ditz and was always an alien. 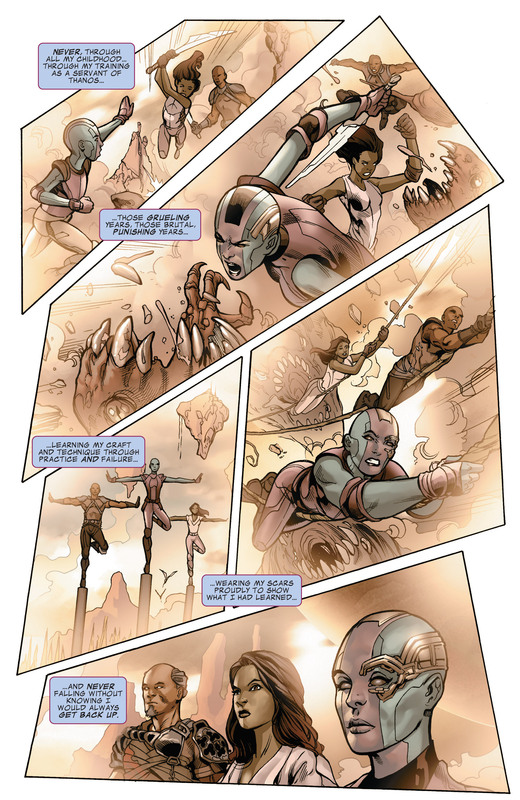 The scenes in this comic also exemplify another problem I have with the movie: Gamora was supposed to be indoctrinated, trained by Thanos alongside Nebula since childhood, and his favorite daughter. 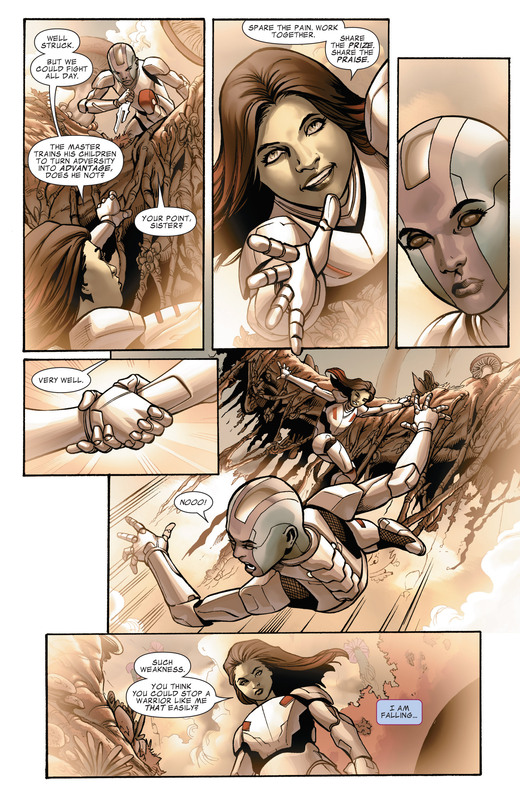 ...so why did she just immediately become the good, compassionate girl who feels so sorry for everything when she was willing to let Nebula die here? Re: Did we watch the same movie? You forget that the movies are a different continuity from the comics. Yondu in the films is different from the one in the comics. And having Drax be an alien made sense for an adaptation, it's less complicated. And i prefer a movie that doesn't take itself seriously, it's better than a grimdark movie. So yes, Guardians of the Galaxy was great because it was a fun movie. 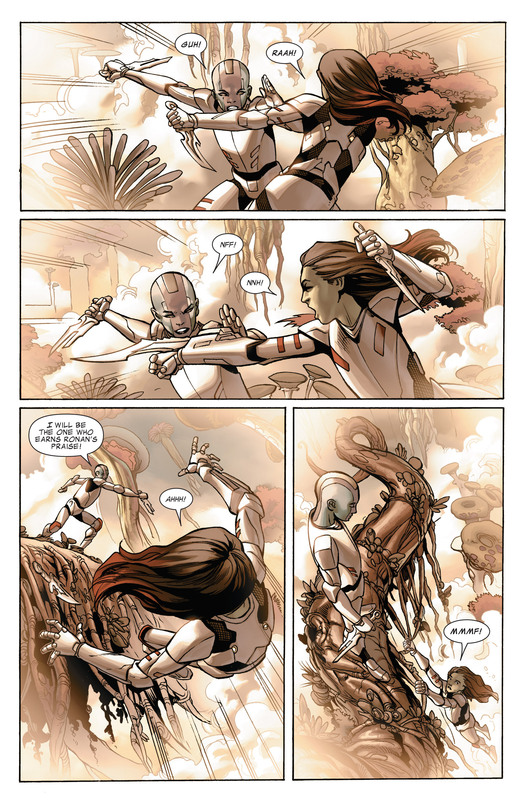 And Gamora turned on Thanos because he killed her parents. She obviously never liked Thanos, neither did Nebula. Seriously, if you are angry that the film was different from the comics, the you missed the point. Oh it definitely isn't perfect. Ronan and Thanos are pretty empty villains (actually Ronan and Malekith from Thor 2 are virtually interchangeable), Gamora is weakly characterized, and this is like the third Marvel movie that uses the standard "infinity stone / MacGuffin that yields ultimate power / destruction etc.". It's still the least cluttered Marvel movie (there's no wasted time on needless character cameos to please fans), and definitely has the best structured / paced story (the Avengers was great but it's a pretty uneven film). Stuff like changing the Nova Corps and Yondu doesn't make it a worse movie (plus the original Drax was always a ditz, which was way more fun than grimdark murderface new Drax). And I think for a movie about superheroes and talking trees and raccoons in space it took itself about as seriously as it should have.